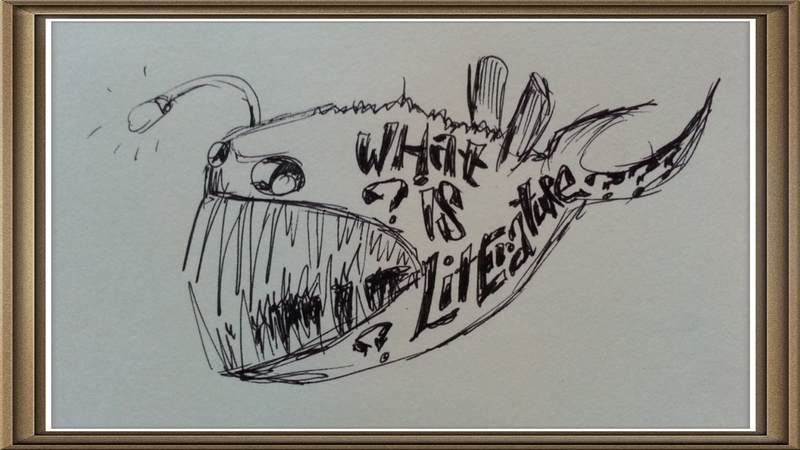 Category Archives: Lit–What is Literature? What is Literature? Part Three: What Isn’t? Before we’re back to our regularly scheduled programming of discussing specific works (I’m currently snail’s pacing my way through Umberto Eco’s The Name of the Rose), I’d like to do one last exploration for my “What is Literature?” series. In the first part of the series, I talked about how those most immersed in lit are sometimes the worst people to ask. In the second post of the series, I unsuccessfully tried to dream up literary criteria using examples. Today, I wanted to see if I could at least decide what literature isn’t. Maybe I can come up with a woefully oversimplified definition through opposing qualities. It’s sure to be as flawed as any invented and imposed binary system, but at least it’d be something to work with. Once, when I was at O’Hare getting ready to fly, I thought I’d stop and look at a Hudson News for a crossword puzzle. I stared at the rows and rows of Sudoku, which I despise. No crosswords in sight. Fine, a book then. Here are shelves teeming with mystery and crime behemoths, sure to reward the buyer with a cardboard cutout detective who meets a sassy and attractive problem-solving partner. Each cliffhanging chapter will leave our cavernous, undeveloped characters in some kind of peril which momentarily distracts them from the stilted and formulaic sexual tension between them. As I looked up and down the rows, finding exactly zero things I thought I could stomach, I decided that Sky Mall had more appeal–at least it has a sense of humor about itself. Airport bookstores are where you go to find examples of “not literature,” in my opinion. Like I said in my last post, it isn’t that I hate contemporary lit–or even that I hate popular lit. I just hate bad books with bad characters and tired plots. Most authors have a decent idea or two. But those ideas are smothered by predictable, cheap engagement tactics and–the worst–empty shells in lieu of characters. The primary offender here is someone like Dan Brown. But what about books I wouldn’t call bad but still can’t think of as literature? To me, Stephen King fits into this category. Most of what I’ve read from him is recent, and fans tell me that I’d change my mind if I read The Stand or The Dark Tower. So I qualify what I’m saying by admitting I haven’t read what most consider his best stuff. But, to me, King is a plotsmith and nothing more. He writes forgettable characters and has very forgettable prose. But the plots captivate, especially in the moment, and sometimes haunt the reader well after the book is finished. Is this enough to make it literature? My personal feeling is that, no, it’s not. And it’s really, really difficult for me to pin down why. What’s the difference between a King book and, say, Wuthering Heights? I like one more than the other, but I’m taking an extra step in calling something “literature” or “not literature.” Even coming from someone who thinks the standards for literature are subjective, I simply feel that I’m appealing to something more universal when I talk about literature versus personal taste. Is it the prose? Is it the characters? Is that really the difference between “literature” and “not literature” to me? As I’m contemplating this, I’m tossing around the idea that insecurity is buried underneath mountains of snobbery. Do I define “not literature” according to ideas of purpose: specifically, edification as opposed to entertainment? In other words, do I let the question “is this book amusing me or elevating me?” dictate my definition, making sure I only consider those books that make me feel serious, classy, and educated as literature? In trying to find an honest answer, I just can’t think it’s so. I read Dickens more for entertainment than any feeling of self-satisfied refinement I might get from being a person who reads the classics. But on a subconscious level I do wonder how much of my definition of literature is tied in with self image. I’ve seen plenty egos forged in the fires of classics-immersion. (Glasses pushed down the nose, tea in hand, pinkie extended–all optional but desirable.) I don’t think I’m in that club. But it’s hard to say, being so unable to define literature clearly to myself. But enough waxing philosophic! Next on the agenda comes thoughts on The Name of the Rose, or at the very least this copy of The Elements of Style that’s been sitting by my bed. Slow reading these days. Looking for a job really is a full-time job. In the first post of this series, I discussed a few of the complications that come up when you ask a Lit major the question “what is literature?” Here, I’ll work inductively toward an answer of what, to me, qualifies a work as literature. In the next post, I’ll try to understand why I don’t classify some books as literature. Disclaimer: this is just an attempt to figure out what makes something literature or not to me personally. This is not what I believe to be universal, cosmically-verified fact. I don’t think anyone can give a definition of literature on which everyone can agree, and some people will hate even my very first premise. Which is this. Dostoyevsky’s Crime and Punishment is the absolute epitome of literature. When I think of why I love books, what I love about Crime and Punishment specifically comes to mind first. And what is it that so draws me to Crime and Punishment? It’s a combination of elegance and rawness–elegance in the form of language and treatment of characters, rawness in the form of portraying human vulnerability and suffering. It’s character development. Dostoyevsky’s main characters are fully formed and have all the complexity and contradictory elements that can be found in real human psychology. (This is especially true of the male ones–the females have a bit of Ophelia/Hero/Desdemona syndrome in which self-sacrifice, purity, and helplessness are the only defining characteristics. But this is another discussion.) Crime and Punishment has done something to me in my most misanthropic moments. If I read it, I feel a connection with my fellow humans again. I remember what it’s like to feel compassion. So how can I go from this, my favorite book, to defining literature? Well, I thought I’d base it on what I think qualifies Crime and Punishment as its paragon. When I thought about this a few days ago, I came up with a list from Crime and Punishment of what I thought might act as a defining point for a general literature definition. But every potential defining point forced consideration of a literary outlier for which I couldn’t account. For example, let’s say I wanted to make some kind of moral argument. That’s not really my style, but it’s worth investigating. Crime and Punishment makes me more compassionate in real life, so maybe we can say that literature will have the effect of making a person or society better. Well, there’s several problems with that. Number one (and this is a big question), better how? Who defines better? Number two, several works I think qualify as literature, without really even knowing yet what I think that means, don’t make me or anyone else better. They might exist mostly for the sake of form play, like Ulysses. Or they might exist as art for art’s sake: every play from Wilde is like literary sugar with virtually no effect on the soul. They might be simple celebrations of language’s power to sculpt a scene. I remember a four-page description of a feast laid out on a table in A Christmas Carol (which I haven’t picked up since I was fourteen, so I hope I’m remembering this right), and it was delightful. Isolated from the rest of the novel, which certainly has a moral component, the description alone would make these pages literature, in my mind. So the moral angle is out. With it goes the idea that literature must have an effect on your everyday life or change you in some way. Wilde’s witty romances and Dickens’ talk of cranberry sauce didn’t change my life or my outlook on it. But aha! After looking at this, a commonality has emerged. Both Dostoyevsky and Dickens have beautiful use of language. Maybe this can be a working point of definition for literature. But no–Hemmingway. I’m not overly fond, but I’ve read (for one) The Old Man and the Sea, and it’s literature–no question about it. For some authors, language nothing but a necessary utility to get a story across. For Hemmingway, mastering language means figuring out how to make language get the least in the way of plot as possible, and he does a very effective job at it. But Hemmingway’s old fisherman is fully formed character. Maybe it’s character development that defines literature. I might be on to something here, as far as my own definition of literature goes, because lack of character development is one of my biggest criticisms of modern books. But if I make character development a necessity, I eliminate from the discussion all works without any characters. The Dickens Christmas Carol passage is out. The rainwater-glazed, chicken-surrounded red wheelbarrow only can sit in the lobby of the literary hotel–in fact many poems can’t be considered literature if there must be characters in the work. So I can’t say that character depth is a defining aspect, either. I could say that, if there are characters, they must be fully formed. But how subjective of a criterion is that? I’m sure plenty of people would say that, for instance, Elizabeth Bennet of Pride and Prejudice is a fully-formed character, and I would argue that she isn’t at all (even her contrariness is predictable and dull as dishwater, in my opinion). Well, here’s something. Everything I’ve mentioned as literature is fairly old. I said that lack of great, fleshed-out characters in modern books is something I hate, and all things I’ve mentioned so far are at least pre-1960. Maybe the pages just have to be yellow. But even as I type that, I know how ridiculous a criterion that would be. House of Leaves is absolutely literature. It belongs more squarely in the category of literature than half the things I read in my Ancient Lit class. It’s much more literary than the Iliad. (Yeah, I said it.) Cloud Atlas is a literary masterpiece–a whole world and a whole age contained in itself. And, oh, the masterful, unassumingly-titled A Visit From the Goon Squad, an undercover mural of gorgeousness. No way does a work need to be old to be considered literature, and shame on anyone who says so. So where does this leave me in my bottom-up definition of literature? Well, if there are characters, they should be good ones. And there isn’t really any objective way to decide whether or not they’re good. So that wasn’t very productive at all. Lit·er·a·ture. noun. 1. A slippery fish. This will be the first in a series of posts over the next few days in which I tackle a beast of a question: what is literature? Before really confronting the subject, I wanted to relay some thoughts I’ve had as a Lit major just recently out of school, surrounded by peers studying the same. I’ve spent years trying to define literature–not even broadly, just looking for my own personal, working definition. After all, what literature is and isn’t amounts to individual standards, tastes, and regard for expert opinion/the test of time, which will vary person to person. As is the case in regards to individual perception of beauty as described by Kant, another inherent (yet oxymoronic) conviction is that my personal decision about what is and isn’t literature should also be everyone else’s personal decision, but I’m going to try to pretend that I’m fine with dissenting opinions in an attempt to make it truly so. Faking it (non-judgmentalism) till I make it, if you will. So let me take this opportunity to say, with bright smile and gritted teeth, I encourage all disagreement! It took me a long time to figure out that I didn’t actually know how to define literature. In my last semester at my community college, I took an American Lit class with a stand-out teacher who seemed to specialize in challenging ways of thinking. On the first day, he made each of us articulate our definition of “literature.” It was a disaster. There was never a doubt, even before I took my first college course, that I would major in Literature, so I was pretty perturbed when my turn came and I had nothing to say about the very subject in which I was aiming to become an expert. But as I went on with my studies, I quickly learned that I wasn’t alone in my inability to nail it down. Most majors have pretty pragmatic uses. Oh, you’re studying medicine? If we didn’t have people like you, I would have died of pneumonia about seven years ago, so that’s pretty useful. Studying geology? Cool–please let us know when to evacuate the entire American West because Yellowstone is about to flip its lid. History major? A tiny bit harder to make the case for, but it teaches us patterns, helps us understand international relations, is of tremendous use in politics, etc. What’s the common thread here? Use to society. When most Lit majors try define literature, they simultaneously make an argument for its value. It’s as if the question “what is literature?” implies a begged question, “why is literature worthwhile?” (Or perhaps, in some people’s cases, “I’m paying for you to major in WHAT? Absolutely not–you’ll become a registered nurse like we discussed”). Maybe it’s because literature, like art, seems so much more like a luxury rather than a necessity when compared to other areas of study. Therefore, when we talk about what literature is, Lit majors often immediately go on the defensive and try to make a cause for the betterment of society. Elevated minds and culture and all that. I’m not at all belittling the societal benefits of literature, but I am saying that Lit majors often don’t have clear enough heads to think about the subject critically because they’re too busy jumping to the part where they defend it. This is, of course, not a tirade against Shakespeare or especially against the people who study him and adore him. In fact, the majority of the truly brilliant people I’ve met in the field are primarily Shakespeare scholars (probably contributing to the mimicked worship described above–thanks, guys). I’m just bringing to light some of the encoded messages in a Lit major’s discussion of the subject that might not appear in, say, a math student’s definition of literature. I’m going to try to be the exception to the rule in my discussion of the subject. This shouldn’t be too hard for a few reasons. 1. I’ve been watching and taking note of bad definitions of literature from Lit majors for a few years now. 2. I am fortunate to lack the insecurity of many Lit majors because, as an adult student, I’ve never been required to justify my desire to study books to any funding entity. My only thought was “Man, I sure dig reading” when choosing my major. 3. If anything, I feel a teenage-angsty rebellion toward the experts. A million brilliant people over a long period of time have said this is worth reading? Fine. I’ll read it, and I’ll look for what they found valuable. That doesn’t mean I will come to the same conclusion. I’m very aware of the Emperor’s New Clothes Syndrome, and–Hume be damned–I think time can fail to expose the truth. 4. Do I think literature adds value to society? Absolutely! Do I think that value can always be concretely defined or empirically verified? Not in the slightest. The value of literature to society should be part of the conversation. It should not be the whole conversation.